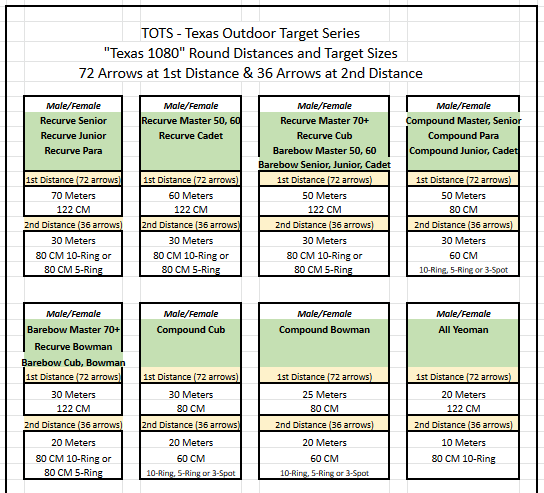 Join us as part of the Texas Outdoor Target Series (TOTS) Tournaments! Travel around Texas shooting in up to 12 different TOTS Tournaments. Central Texas Archery will be hosting 2 events this season! This is a single day tournament with two sets of 36 arrows (72 total) at the first and longest distance, and then another 36 arrows at a closer distance. See distance chart shown below for your age and bow type. Archers who compete in at least three of the tournaments are eligible to compete in the championship. The winner of each division will be determined by their three highest scores added to the doubling of the Championship TOTS score. For the winners last year, belt buckles were awarded at the Championship to Youth Female (Top 2 scores received a belt buckle), Youth Male (Top 2 scores received a belt buckle), Adult Male (Only the top score received a belt buckle), and Adult Female (Only the top score received a belt buckle). This is subject to change based on number of archers who participate. The TOTS events will now be USA Archery Sanctioned events -- this means your scores will be eligible to set NATIONAL RECORDS! Woo Hoo! Registration Info: Archers register for each tournament individually. The first 2 tournaments registrations are open at www.usarchery.sport80.com Archers must be a member of USA Archery of NFAA to register for these tournaments. Registration for the tournaments hosted Central Texas Archery will be available soon.